The British Expeditionary Force faced is own anabasis in 1940, and the story is also an epic one of tragedy, heroism, sacrifice and stupidity. 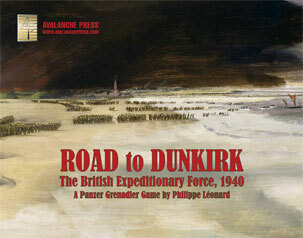 Our own Xenophon, Philippe Léonard, has told it well in Panzer Grenadier: Road to Dunkirk. Let’s look at more of the scenarios. You can see Chapter One here, Chapter Two here, Chapter Three here, Chapter Four here and the first half of Chapter Five here. The British troops at Hazebrouck, Hondeghem and Cassel, and at various points along the La Bassée canal, had delayed the Germans just long enough to allow the next layer of Allied forces to form up. But the crucial action protecting the long western flank of the corridor leading to Dunkirk was the tenacious stand of the 48th Division north of Cassel. The division staff planned an all-round defense of the villages, as the Germans could come from any or every direction. As expected, they attacked Arnèke first. The Germans struck during the evening of 27 May and met a hostile reception from the 25mm guns and 2-pounders that had been moved up to support the British garrison. Both tanks and infantry suffered heavy losses as they approached the railway line. One 2-pounder alone accounted for five tanks and four armored cars, and then fired directly at the infantry as they swarmed over the railway. Nevertheless, the German armor nearly overcame the Glosters in a matter of hours. At one point armored vehicles drove into the village and fired at point-blank range into the garrison’s HQ (a local bar). The British response was furious until all vehicles withdrew. This gave the Glosters an opportunity to withdraw from the village during the night. The sun never sets on the British Empire, but it does set on its defenders. The Brits are holding a small chain of villages and the Germans are trying to seize them before darkness falls. The Germans have some light-weight armor, but the British have anti-tank guns well able to take them out. Plus they’re British. Major-General Edmund Osborne commanding the British 44th “Home Counties” Infantry Division and General René Prioux, new commander of the French First Army, heartily despised one another yet had to cooperate to hold open the corridor to Dunkirk. Amid reciprocal accusations of treachery, Osborne retreated to the Mont des Cats, a naturally strong position on top of a sandy hill. In mid-morning, British infantry observed German tanks moving on a town at the foot of the hill. French tanks immediately moved to intercept them. The H35 tanks from 2e escadron, 18e Dragons intervened against four German tanks supported by infantry which had attacked Eecke from the North. They smashed a truck convoy and one of the German tanks was quickly destroyed by a tank from the 26e bataillon de chars de combat (attached since 18th of May). The 3e escadron joined the fray and a total of eight German tanks were destroyed in a few minutes which completely stalled the attack. Osborne’s battered troops held on to their dominating position throughout the following day enabling 2,500 men from 5th Brigade to withdraw behind them. The Brits are under attack by waves of German panzers when the cavalry arrives. French cavalry, with tanks of their own and morale reminiscent of the Seigneur de Bayard, the chevalier sans peur et sans reproche. The Belgian ceasefire on 28 May allowed the German 18th Army to turn west along the coast against the Dunkirk perimeter. Partial flooding made the land east of Nieuport impassable except for elevated roads, and thanks to the 12th Lancers’ patrols most of the bridges across the canals had been destroyed. Some locks and thelong stone bridge of Nieuport remained intact. The defense of Nieuport behind the Yser line sucked in a host of miscellaneous units drafted from anywhere within reach. The armored cars of 12th Lancers guarded the exposed flank while a few British light tanks, engineer companies, artillery gunners and French infantrymen gathered to hold at all costs. A section of Brandenburger commandos made a successful nighttime raid to ensure the main floodgates of the Yser River would not be destroyed. When the attack was launched early the next morning, German numerical superiority sealed the issue. Using pontoons thrown across the canal, they invaded the western side of the canal and surrounded most of the French defenders. Despite these infiltrations, British resistance behind the Nieuport bridge remained incredibly strong and repulsed all German attempts to reach the evacuation zone at La Pannely. Nieuport, on the edge of the beaches stretching to Dunkirk, remained a lynchpin of the Allied defense until late on 31 May. No one’s really all that eager to be here, as the unenthusiastic Brits with some French assistance try to hold a series of bridges from equally unenthusiastic Germans. The Brits actually have more artillery, but there are an awful lot of Germans coming at them. The 1st Welsh Guards supported by Brigadier C.W. Norman’s 1st Light Armoured Reconnaissance Brigade set out for Rexpoede in response to German threats against the western flank of the corridor through which the BEF was withdrawing to Dunkirk. Roads choked by transport and streams of soldiers seeking the coast made it a difficult trip. The battalion held a triangle-shaped position, the base of which faced south-west. In the early afternoon, German tanks and infantry attacked West Cassel from the south-west, scattering the defenders. For a time troops desperately fighting from the grounds of a moated chateau behind the village church held off the Germans. Tanks entered the village after a heavy mortar barrage, surrounding and pinning down the British in and around the chateau. Meanwhile in Vijfweg, the Guards stemmed the tide with the help of light tanks and a battery of Royal Horse Artillery. The 1st Fife and Forfarshire tanks faced the panzers at short range while the Bren carrier crews used their anti-tank rifles. At about 1800 the defenders were ordered to move to the coast for evacuation. This time it’s the Welsh Guards, and they’re not going to be moved out of their positions easily. Players get to fight it out with crapulent tanks, too (Pz I vs. Mark VIb, not a matchup likely to inspire a video game). May 29 was a vital day for the BEF’s withdrawal. To cover the divisions that threaded their way back to Dunkirk, 3rd Division held the line between Noordschote and Poperingen. The Germans launched furious attacks supported by heavy shelling and aimed at closing the BEF’s escape route. The history of the Royal Ulster Rifles records that the day spent at Woesten was one of the most unpleasant experienced by the 2nd Battalion. As the battalion started to thin out in preparation for withdrawal to the Dunkirk perimeter, the Germans struck. As the Rifles prepared to move out, the weight of artillery falling on the battalion’s positions increased and machine-gun fire began to fall around the trenches, making any movement above ground dangerous. At 2030 German infantry rushed the Rifles’ positions in a concentrated assault. The withdrawal became a series of confused running battles in the fading light, but every section held its position until the time laid down for “final abandonment.” One isolated forward and under-strength platoon was saved by a splendid action by a carrier section of 2nd Lincolns, which came forward and having destroyed two enemy machine-guns, lifted the riflemen back. The Lincolns’ carriers completed the day’s work by ambushing a party of enemy motorcyclists, and the Rifles’ main body continued on its way towards the sea. This is another unusual scenario, with the British forced to hold against a German attack and then try to withdraw without breaking contact, while the Germans keep attacking and chasing them. The Germans are pretty stout, but the Ulstermen have Guard-like morale. And only one transport unit, so they’ll have to get away on foot. All means of communication in and out of Dunkirk – road, rail and canal – passed through Furnes on the outer perimeter. Should the Germans capture it, they could roll up the embarkation beaches. Third Division defended the perimeter from the east. By the time the division arrived at Furnes nearly 100,000 troops, British and French, had already escaped. But the Allies would need four more days to embark all of their men. Thanks to the waterlogged ground, the defenders could only dig in along the edges of the roads and banks. At 1715, after heavy artillery preparation, two battalions from the 192nd Infantry Regiment tried to cross the canal using assault boats, just north of Furnes, at the junction between the Royal Engineers and the Berkshires. Although many German boats sank in mid-canal, by dusk they had gained a temporary footing on the near bank. To prevent a complete encirclement of the town, carriers from 2nd Grenadiers and a company of the 1st Coldstream Guards took over part of the position. These reinforcements rallied the dispirited troops, went in with the bayonet and restored the line. At about 2200 the Germans attacked again and temporarily broke across the canal but the British front remained intact up to the moment of withdrawal. This one’s going to be tough on the Germans. They have plenty of troops and enormous amounts of artillery to make their way across the river. The British have the Coldstream Guards. And that’s the second half of Chapter Five. You can order Road to Dunkirk right here.